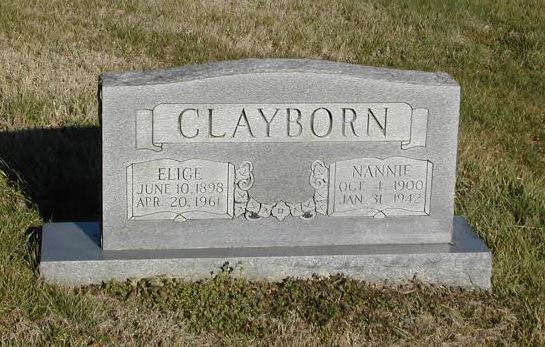 William Elijah Clayborn (called “Lige”) was born on 10 June 1898 to William H. and Melinda Clayborn. [The birthdate is based on Lige’s tombstone. His World War I Draft Registration Card (Dekalb County, Tennessee; Roll: 1852979) gives the date as 10 September 1897.] 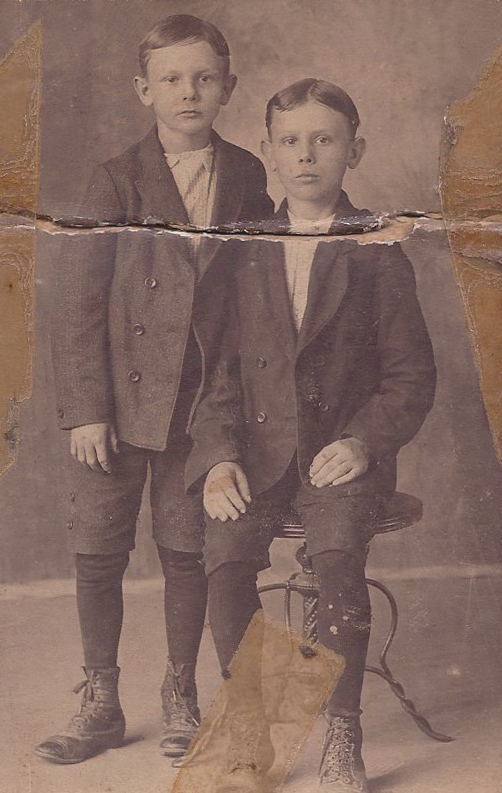 He married on 9 July 1916 to Nancy Malone (“Nannie”) (born on 4 October 1900). 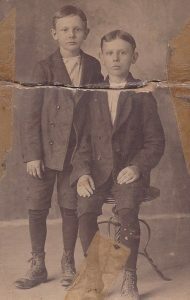 Together they had two sons, listed below. Nannie died on 31 January 1942. Lige married (2nd) on 9 April 1942 to Emily Athlee Johnson (called “Lee”) (born on 1 February 1922) and together they had one daughter, Dianna, listed below. Lige died on 20 April 1961 and is buried in Dismal Cemetery, near Liberty, Tennessee. Lee died on 10 May 1999. Howard E. Clayborn (click name for separate biographical sketch) was born on 14 June 1917 to William and Nannie Clayborn in Dismal, Tennessee. He died on 11 January 1990. 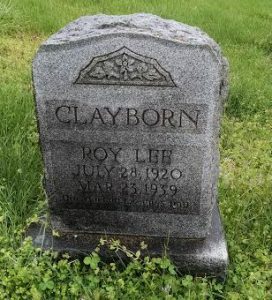 Roy Lee Clayborn was born on 28 July 1920 to William and Nannie Clayborn. [Roy Clayborn’s birth date is copied from his tombstone in Dismal Cemetery in Liberty, Tennessee.] He married Lena Spence on 17 December 1938 in DeKalb County, Tennessee. Just three months after their wedding, Roy was tragically killed on 23 March 1939. [Obituary of Roy Lee Clayborn, Smithville Review Newspaper, 30 Mar 1939 Issue.] He was thrown by a mule he was riding and his legs entangled in the gear. When he was found the mule was on one side of the fence and Roy’s body on the other. He is buried in Dismal Cemetery, near Liberty, Tennessee. 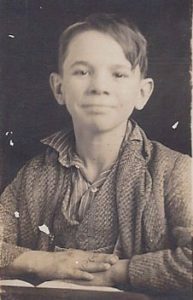 Roy Lee Clayborn’s school picture in 1930. 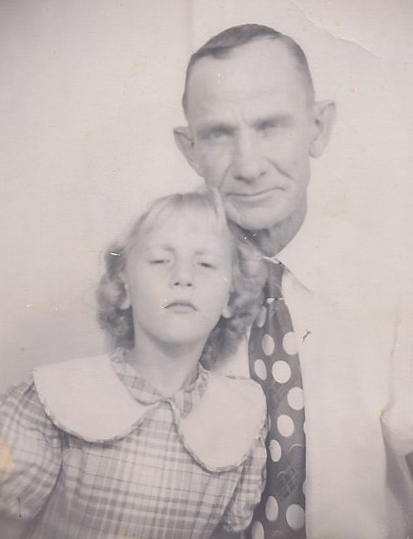 Roy Lee Clayborn and Lena F. Spence Clayborn in 1938. Roy would be killed less than a year after this picture was taken. Dianna Clayborn was born on 6 March 1946 to William Elijah “Lige” and Emily Athlee “Lee” Johnson Clayborn. After Lige died in 1961, Lee would marry Emmett H. Fathera on 10 July 1965 and together they had a son, Rex Lee Fathera (born 31 March 1969) when Lee was forty-seven years old. Lee worked primarily as a homemaker, but was employed for several years by the Murfreesboro City Schools as a cook at Campus School in Murfreesboro, Tennessee. Emmett would die on 12 July 1976. 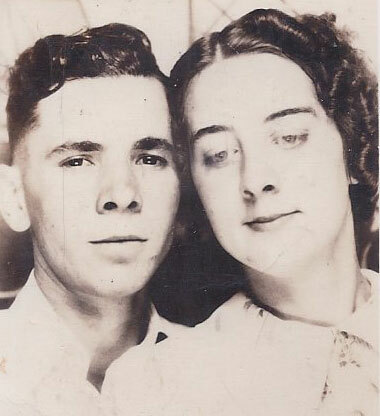 Lee later would marry Allen Hartley who lived in East Tennessee, but this marriage lasted just a few months and she moved back to DeKalb County with her son, Rex. 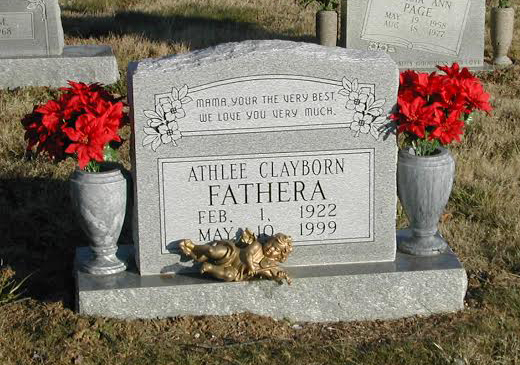 Emily Athlee Johnson Clayborn Fathera Hartley passed away after an extended illness at her home in Alexandria, DeKalb County, Tennessee, on 10 May 1999 and was buried in Hillview Memorial Gardens in Alexandria, Tennessee. 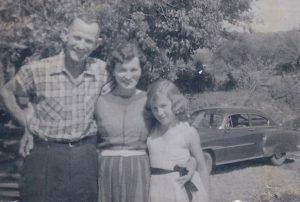 Dianna Clayborn married on 1 June 1962 to Fred Earl Curtis (called “Toad”) in Liberty, Tennessee, with the wedding officiated by her half brother, Howard E. Clayborn. [Fred Curtis was born on 26 January 1943.] Dianna and Toad lived in Chatsworth, Georgia, for one year (1968-1969) and then moved to Asheville, North Carolina, for one year (1969-1970). They then returned to Alexandria, DeKalb County, Tennessee, where they lived in 2015. Dianna worked at Alexandria Garment Mfg., Liberty Shirt Factory, and at Norvell, Industries from 1978 through at least 2015. Toad Curtis hauled milk from farms to the processing plants for Dairymen, Inc. for over 30 years. He then hauled freight for Venture, Inc. for another ten years before retiring. Together Dianna Clayborn and Toad Curtis had two sons. William Freddy Curtis (“Freddy”) was born on 2 April 1963 in Lebanon, Tennessee. [Freddy corresponded with Joshua A. Claybourn in 2009 and provided the bulk of information about this branch through his own independent research.] He graduated from DeKalb County High School in 1981 and Lee University in 1986 with a degree in social science and emphasis in history and Christian education. He graduated with a master’s degree in instructional leadership from Tennessee Technological University in 2000. Freddy married on 18 December 1981 to Trena Willann Braswell (born on 7 December 1962). Together Freddy and Trena had four sons. From 1986 to January 2002 Freddy worked as a teacher at West Side Elementary School in Readyville, Tennessee. In February 2002, he became Principal of West Side Elementary School and served in that position until June 2008. In July 2008, Freddy became teacher of U.S. government, sociology, and advanced placement U.S. government and politics at Cannon County High School. In 2014 he was named the Cannon County School District and Upper Cumberland Regional Teacher of the Year. Freddy also served as an ordained bishop in the Church of God (Cleveland, Tennessee) and ministered as senior pastor at numerous Church of God congregations in the Middle Tennessee area. He was elected to the Tennessee Church of God Youth and Christian Education Board in 1998 and 2000 by his fellow Tennessee Church of God ministers. An avid amateur radio operator (FCC Call-sign – W4WFC ex: KC4GUG) he has made thousands of radio contacts over the years and was the founding president of the DeKalb/Cannon County Amateur Radio Club. Freddy and Trena Curtis lived in Smithville, DeKalb County, Tennessee in 2015. Trena Willann Braswell Curtis died on 11 June 2015 at her and Freddy’s home in Smithville, Tennessee, after a six year battle with cancer. She was born on 7 December 1962 in Smithville and was a retired second grade teacher with the DeKalb County Board of Education at Smithville Elementary School for twenty-four years. Trena was a 1987 graduate of Lee University and a member of the Alexandria Church of God. She loved playing the piano and organ at the numerous churches that she and her husband had the privilege to pastor. She was an amateur radio operator (call-sign: KD4ESF), a founding member alongside her husband of the DeKalb/Cannon County Amateur Radio Club, and loved to crochet. Trena was buried at DeKalb Memorial Gardens in Smithville. Fredrick Matthew Curtis (“Matt”) was born on 16 June 1983 in Smithville, DeKalb County, Tennessee. He attended and graduated from DeKalb County High School (2001),Tennessee Technological University majoring in political science (2006), and the Nashville School of Law in 2013. He passed the Tennessee bar exam in spring 2014 and was subsequently employed by Progressive Savings Bank in Cookeville, Tennessee, as corporate counsel and resided in Cookeville, Putnam County, Tennessee in 2015. Trent Braswell Curtis was born on 12 January 1987 in Murfreesboro, Rutherford County, Tennessee. He attended and graduated from DeKalb County High School (2005) and later attended Motlow State Community College. He married on 7 November 2009 to Tessa Nicole Witt (born on 5 November 1987) in McMinnville, Warren County, Tennessee. Together Trent and Tessa had two children, Ella Mae Curtis (born on 14 May 2010 in McMinnville, Warren County, Tennessee) and Elliott Witt Curtis (born on 30 August 2013 in Chattanooga, Hamilton County, Tennessee). Trent worked as a network engineer at Riverpark Hospital in McMinnville, Tennessee, and lived in Morrison, Warren County, Tennessee in 2015. Casey Warren Curtis was born on 24 June 1990 in Murfreesboro, Rutherford County, Tennessee. He attended and graduated from DeKalb County High School (2008), Motlow State Community College (2011), and Tennessee Technological University majoring in computer information systems (2013). He married on 21 June 2014 to Haley Marie Snyder (born on 7 April 1993). Casey worked for the Hospital Corporation of America in Franklin, Tennessee, as a website designer. 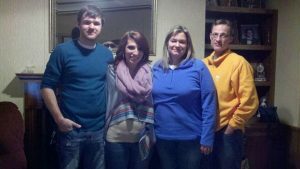 Casey and Haley Curtis resided in Alexandria, DeKalb County, Tennessee, on Lower Helton Road in 2015. The farm on which they lived was just over the hill from the “Clayborn Hollow” in the Dismal Community of DeKalb County and less than a mile away from where the first Curtis families of DeKalb County settled in the early 1800s. Evan Madison Curtis was born on 6 April 1995 in Murfreesboro, Rutherford County, Tennessee. He attended and graduated from DeKalb County High School in 2013 where he played basketball for two years and baseball for all four years. He was named to the Tennessee TSSAA District 8AA All District Baseball Team in 2013. He also attended Tennessee Technological University and Motlow State Community College and lived in Smithville, DeKalb County, Tennessee, in 2015. Jonathan Haynes Curtis (“John”) was born on 2 November 1969 in Asheville, Buncombe County, North Carolina. He attended and graduated from DeKalb County High School in 1988. He married Melissa Johnson in 1990 in Smithville, DeKalb County, Tennessee. [Born on 14 January 1971, Melissa Johnson was the daughter of Joyce Clayborn Johnson, who was granddaughter of Charlie Clayborn, Lige’s brother.] Together John and Melissa had one daughter, Kellen Danielle Curtis. John and Melissa divorced in 2006. In 2006 John married Angie Backus in Alexandria, DeKalb County, Tennessee. They were married until 2010. 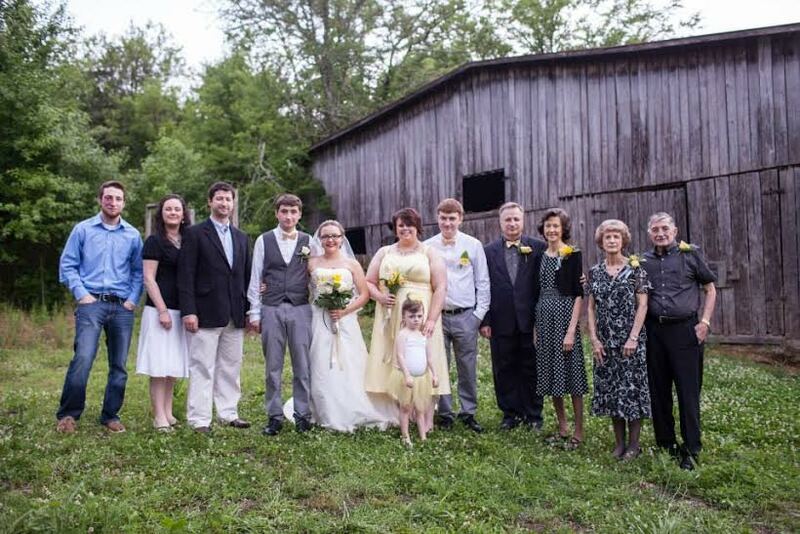 On 3 March 2011, John married Rachel Ann Gleaves (born on 29 December 1978) in Cookeville, Putnam County, Tennessee. They lived in Mt. Juliet, Wilson County, Tennessee in 2015. Kellen Danielle Curtis was born on 26 December 1995 in Nashville, Davidson County, Tennessee. She attended DeKalb County High School and Wilson Central High School, graduating in 2014. Kellen married on 2 January 2014 to Axyl Kane Chalfont (born on 16 May 1992) in Smithville, DeKalb County, Tennessee, where they lived in 2015. Together Kellen and Axyl had a son, Tristan Seth Chalfont, born on 18 June 2015 at Summit Medical Center in Hermitage, Davidson County, Tennessee.